On Monday night, Jeff and I ran out of excuses to why we shouldn't start sleep training Jillian. We had just received a glowing report from Jillian's ENT that morning and knew that her ears had never been better. The time to let her 'Cry It Out' was now. Jeff and I gave each other pep talks all day that we were finally going to do it. Tonight was the night. The moment that we were going to give our daughter the gift of sleep. I had read several books on sleep training and felt about as confident as I could on the subject. In addition to reading sleep training books, the key to feeling good about beginning a sleep training program is to also talk to other Mom's about their sleep training experiences. I spoke to my Mom, my sister, co-workers, friends, and other Mommy bloggers. I asked them hundreds of questions. And you know what? Every Mom I spoke to had a success story to share. Not one said sleep training didn't work for them. Every one of them told me to be strong and stick with it. The end result far outweighs just a few nights of crying. "Just keep your eye on the prize" I was told. 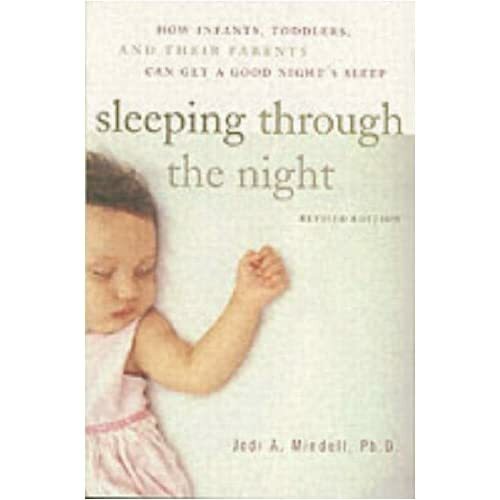 Feeling confidant about our decision to start sleep training, we decided to follow the method best explained in the book "Sleeping Through the Night" by Jodi A. Mindell, PhD. I felt that out of all the books I had read, this 'Cry It Out' method was the "kindest" of them all. Step 1 - Set Bedtime: Your baby needs to go to bed at the same time every night. It's important to set your baby's internal clock so that their body is accustomed to falling asleep at the exact same time every night. Baby's relish routine. Step 2 - Establish a Bedtime Routine: A set bedtime routine is essential to your baby's being able to fall asleep easily and quickly. It helps your baby get sleepy and transition from daytime to nighttime. Jeff and I decided that we were going to consistently follow the 3 B's. Bath, Bottle, Book for our bedtime routine. Step 3 - Bedroom Environment: You need to make sure that your baby's bedroom is the same all the time when he is sleeping. Eliminate all negative sleep associations. If you baby falls asleep to a sound machine, then it should continue to play throughout the night. Step 4 - Put down Awake: Now is the time to teach your child to fall asleep on his own. This step is obviously the hardest!!!! After your baby's sleep routine is done, put him in his crib, say good night, and leave the room. Don't nurse him, don't stay with him, don't rock him. Here is where it will most likely get ugly. There will be crying, screaming, kicking, tantrums, etc. Wait a few minutes and then decide when you think it is best to go back in for a quick visit. When you do decide to visit, tell them it is OK and that it is time for sleep. Don't pick him up, or cuddle. Be gentle but firm. Stay no longer than one minute. Make your stay very brief and uneventful. You don't want to do anything to reinforce your baby's crying. Leave the room. Wait again. And then check again in a few minutes if you feel you need to. The longer you wait between visits though only makes things easier for both of you. This step obviously will take awhile. Eventually your baby will fall asleep. The first night takes roughly 45 minutes for your baby to stop crying and fall asleep. In regards to night awakenings during sleep training, Jodi's method recommends that you treat any night awakenings as you normally would. She explains that after going through sleep training, your baby should no longer wake up at night after two weeks. This new bedtime routine will remove all negative sleep associations and your baby will no longer have any reason to wake up in the middle of the night. After our first night of sleep training, I no longer agree with this recommendation and will explain why later. Jeff and I decided to set 8:30pm as Jillian's bedtime. She typically would fall asleep between 8pm and 9pm so 8:30pm seemed like a great time to aim for. At 7:45pm we took Jillian upstairs, gave her a bath, fed her a 6 ounce bottle, and then read her a book. We were worried that she may try to fall asleep while drinking her bottle. She was so used to falling asleep that way so we were worried that she would still negatively associate this step as a signal to fall asleep. She closed her eyes a few times but that was about it. For once in her short life, we didn't want her to fall asleep with a bottle in mouth! After she finished her bottle, I read her favorite book, "The Ten Little Ladybugs." I kept glancing over at the clock and grew very nervous as it inched closer and closer to 8:30pm. Oh my God, we were really going to do this! So I gave Jillian a huge hug and a kiss. I told her how much I loved her. I then placed her in her crib. Before she even hit the mattress, she started to cry and kick her legs. Just a reminder that we really needed to do this, just the thought of laying down in her crib and not in my arms freaked her out! I patted her head and made sure that I spoke the words "It's time for sleep Jillian." Not really sure if she understood what I said or not,but I wanted to be consistent. I then turned on her sound machine, switched off her lamp, and shut her bedroom door. She started wailing!!! I quickly ran down the stairs with our video monitor and joined Jeff on the couch. We just sat there and watched her flail about on the monitor. She crawled over to the corner of her crib. We couldn't believe it, she was trying to pull herself up in her crib into a kneeling position. And then she did it! Several times actually and then she would throw herself backwards onto her crib mattress in a raging fit. A complete tantrum ensued. Jeff and I just watched in horror and in fascination at the same time. We actually started laughing at her reaction. We couldn't believe what a fit our baby was throwing. After 15 minutes of said temper tantrum, she calmed down a little bit, but then started wailing again. Jeff decided it was a good time to make his first visit into her room just to let her know that everything was OK. He didn't pick her up, only spoke to her briefly, telling her she was a good girl and needed to go to sleep. He left the room again and she quickly crawled over to the edge of her crib, pulling herself up again into a kneeling position, watching him leave the room. She pretty much stayed in that kneeling position until she laid down and fell asleep. I would say that Jillian cried for 30 minutes straight and then only fussed and whimpered for another 15 before completely falling asleep. Exactly as the book had predicted, around 45 minutes. One of my co-workers told me that her daughter cried for an hour and a half for their first night of sleep training so it does vary. To be honest, the first night was not that bad. I had psyched myself up for a lot of crying myself and it didn't happen. Having Jeff there with me as my partner in crime really made all the difference. It was great knowing we were in it together, working towards a common goal. The night awakening is where it got REALLY ugly. A very unhappy Jillian woke up at 2am as she had been for the past several weeks. I tried to follow what the book said and to treat the night wakening as normal. So I did. I rocked Jillian back to sleep in her room and she fell asleep around 2:30am. I was so excited that it didn't take that long to get her back to sleep. I crawled back into bed and went to sleep. At 3:30am, Jillian woke up again! I couldn't believe it. So back into room I went, completed frustrated and exhausted. I tried everything to get her back to sleep again. I held her, rocked her, and in a moment of desperation, nursed her. Several times I thought she was asleep, however as soon as I tried to place her back into her crib, her eyes would spring open and she would cry. Ugh!!! By 5:30am, I had enough. Jeff walked into Jillian's room, obviously woken up by all of Jillian's sleep protests. We both agreed to screw what the book said about night awakenings, we decided to let her cry it out again. Being awake from 2am to 5:30am was not good for anyone. So we kissed Jillian good night and let her cry it out again. She was sound asleep in ten minutes. How could she not? She was completed exhausted too. Because of our crazy night, she didn't wake up again until 9:30am. Thank the Lord Tuesday is my day off and I was able to sleep until 9:30am too. And you know what? Jillian was all smiles in the morning. She still loved me! OMG- the image of her flailing around had me chuckling! Just wanted to give you a little encouragement and tell you to hang in there!! I know it's so hard at first but it really is worth the effort and heartache once your child sleeps through the night. We followed a lot of Babywise techniques which sounds similar to the book you are using. We started letting Brody CIO at 8 or 9 weeks after getting the ok from our pediatrican. It was very hard and tiring at first. There were a few nights he cried for an hour or longer. It took a couple of weeks but I think when he was around 11 weeks old he was sleeping 9-10 hours straight and not long after he started sleeping 10-12 straight. He has been a great sleeper ever since. I hope you have many restful nights ahead! You did great Momma! I didn't read any books with Brayden but I did something very similar to what you are doing. The only difference is at night, if he woke up I would go in, not talk to him, but pick him up and love on him for a minute then put him back to bed. Within 3 days he was STTN from 8pm - 7am. Now he sleeps from 8pm - 9am. So you are doing wonderfully! Hang in there! I can comment...thanks for this Karen! I know you are so TIRED of messing with this. We'll getcha fixed up in no time though with a little something new! Talk to you soon through email. Good for you and Jillian! Don't get discouraged...every once in a while GG would have a rough night but then we stuck with our plan and it didn't take long before things were back on track! Have a great weekend! You have totally inspired me to do this again. We did CIO around 6 months and it worked perfectly. Now we are way off a schedule and he just had his first cold and was loving all the snuggling and rocking we did. I love it too, but my sanity is waning!